Identification: Low growing evergreen deciduous tree or small shrub with deep green leaves and bright red berries. The trees, which can reach heights of 15-30 feet, form dense single species thickets of intertwining branches. It has oblong or elliptical leaves with 3-13 leaflets about 1-2 inches long, white five-petaled flowers and red berries. When crushed, the leaves smell like turpentine. It is in the same plant family (Anacardiaceae) as poison ivy and poison oak, producing chemicals in its leaves, flowers and fruit that irritate skin and respiratory passages. Because of its holly-like look, it is sometimes used as a Christmas holiday decoration, but USGS has issued a warning against this because of its irritating properties and to discourage its propagation for this purpose. It is on the "Don't Plant" list issued by the Department of Land and Natural Resources (DLNR) in Hawai'i and is on Florida's "Prohibited" list. Original Distribution: It is indigenous to Brazil, Paraguay and Argentina. In its native home range it is found as scattered, individual trees. Current Distribution: It has become naturalized in more than 20 countries in two circumglobal bands. In the U.S. it is found in Florida, Arizona, California, Texas, Louisiana and Hawai'i as well as Puerto Rico and the Bahamas. It is considered one of the two most invasive trees in Florida, the other one being the Australian pine. Site and Date of Introduction: In the 1800's it was sold in Florida as an ornamental, but did not become an aggressively invasive weed until the 1950's. In the late 1950's a single tree was observed in Everglades National Park. By the 1980's it covered 90,000 acres, 10 percent of the park, mainly in pinelands and mangrove swamps. The total amount of acres infested in Florida is now 800,000 and reaches from north of Lake Okechobee to the Everglades. In Hawai'i it has become one of many aggressive aliens plants which are overtaking the native flora. Florida now has laws against its sale and the Hawai'i state government actively discourages its sale. In Texas and Louisiana it is still sold and used as an ornamental. Mode(s) of Introduction: Sold by nurseries as an ornamental. In the late 1800's the federal government encouraged the import of "useful plants" and a federal agency was created to support this. Many problem plants have been introduced this way in the past, and exotics continue to be introduced and spread through nursery sales to landscapers and home gardeners, and through escapees from Botanical Garden Collections. Conservationists need make the public more aware and informed on this subject. Reason(s) Why it has Become Established: It is quick to invade disturbed areas such as the banks of canals and ditches, powerline right-of-ways and idle agricultural land in moist lowland environments. It does especially well in areas that have been cleared and drained for farming. Its small berry-like fruits are dispersed widely by non-native fruit eating birds such as mockingbirds, cedar waxwings and migrating robins. In South Florida the berries have become a major food source for migrating robins, a species believed to be a major cause of the spread of the Christmasberry to new areas. Once established, the trees create dense thickets which shade out other plants. It also can prevent reestablishment of other species through the release of allelopathic substances. It can also invade undisturbed coastal marshland, shrubland and maritime hammocks where it is particularly difficult, if not impossible, to eradicate due to the swampy conditions. 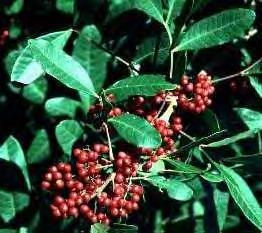 Ecological Role: Brazilian peppertree is a weedy pioneer species which takes advantage of disturbed land. It can tolerate high levels of shade, surviving in the understory until gaps in the canopy create conditions it needs to grow and spread rapidly. It is a prolific seed producer and can live in a variety of habitats. Benefit(s): It has become a major food source for wintering robins in South Florida and is thought to be a possible factor in the increase of robin numbers in recent years. It is also valued by bee keepers for the peppery tasting honey produced from its flowers. Bee keepers have opposed biological control measures in Hawai'i and Florida. In South America various parts of the plant have been used for different medicinal purposes. Threat(s): The dense thickets that it forms shade out native plants and displace animals. In the mangroves of South Florida the thickets destroy foraging areas for herons, egrets and other waterbirds. It is also now seen in the inland portions of mangrove swamps where it threatens waterbird rookeries and breeding habitat for native mangrove songbirds. In mangrove swamps it is almost impossible to eradicate once it is established due to its densely tangled structure and the swampy terrain. Control Level Diagnosis: High Priority - It's ability to grow and spread quickly combined with its tangled thicket structure which makes it difficult to remove, makes it a high priority invasive species. It is shading and crowding out native plant and animals species, creating a monoculture where few native species can live. Control Method: Some biological controls have been tried experimentally with very low success rate in Hawai'i and Florida. Biological controls are opposed by beekeepers in both states. Herbicidal treatment or physical removal via bulldozers, root rakes and chainsaws followed by herbicidal treatment and follow-up seem to be the most widespread controls being used. When using physical removal methods, care must be taken as this can have the opposite effect and cause an increase in density. In the early 1990's a mammoth physical removal project was started in an area of the Everglades known as "Hole-in-the-Donut" to try to restore a 5000 acre area which was heavily infested. The area was part of a 10,000 acre parcel which had been farmed for at least 35 years prior to the 1970's when it was acquired by the park. When the parcel was used agriculturally, the 5000 acre area had been "rock-plowed" (limestone base was broken up to create a richer, deeper soil). When farming was discontinued, that area was quickly taken over by Brazilian peppertree. Since other control methods had been unsuccessful, land managers in the park decided to try removing its means of support by completely scraping away all soil down to the limestone base. This also caused the water level to rise. In the experimental plot, the resulting combination of shallow, poor soil and wetter conditions, was effective in discouraging regrowth. It is felt that the scraped areas will return to a more normal habitat of wetland grasses and sedges. If the project continues on track, they hope to have all the Brazilian peppertree removed by 2016. Control efforts must also include education of the public, as well as laws against the sale and cultivation of the species. Because it is so prolific, isolated efforts at control will not be effective. There must be a coordinated private and public effort if this invasive species is to be controlled and eradicated. Cox, George W., Alien Species in North America and Hawaii - Impacts on Natural Ecosystems, Island Press, Washington, DC, 1999. Devine, Robert, Alien Invasions: America's Battle with Non-Native Animals and Plants, The National Geographic Society, Washington, DC, 1998.